1. Melt butter over a medium high heat in a large soup pot. Sauté the vegetables with the salt until they are well softened, about eight minutes. 2. Pull the vegetables to the sides of the pot and add the chopped garlic to the hole in the center. Sauté the garlic until it is fragrant, about one minute, and then stir in the vegetables. 3. Add the Old Bay seasoning, fish stock, and the sliced Russet potatoes. Bring the pot to a boil, cover, reduce heat and simmer for 10 minutes. 4. Remove the soup from the heat and cool slightly. Briefly process the soup in a standing blender until smooth. Tip: Use the liquid from the canned clams to rinse out the blender jar. Note: If you prefer a more rustic chunky soup, use a potato masher or immersion blender to partial break up the vegetables. 5. Return the soup to the pot and add the clams and the Yukon potatoes. Simmer the soup for 15 more minutes. Tip: Whether you peel the potatoes or not is a personal choice. I peeled the Russet potato, because I was using it mainly as a thickening starch. For the diced Yukon Gold potatoes, I left the skin on for the vitamins and rustic appearance. 6. Stir in the cod and simmer for five minutes. 7. Stir in the shrimp and simmer for five minutes more. 8. Add the cream and continue heating, stirring, until the soup has fully reheated, about two minutes. Tip: Once you add the cream you want to bring the soup up to serving temperature, but you do not want the pot to come to a boil. 9. Serve in individual bowls and garnish with a sprinkle of paprika and fresh cracked pepper. 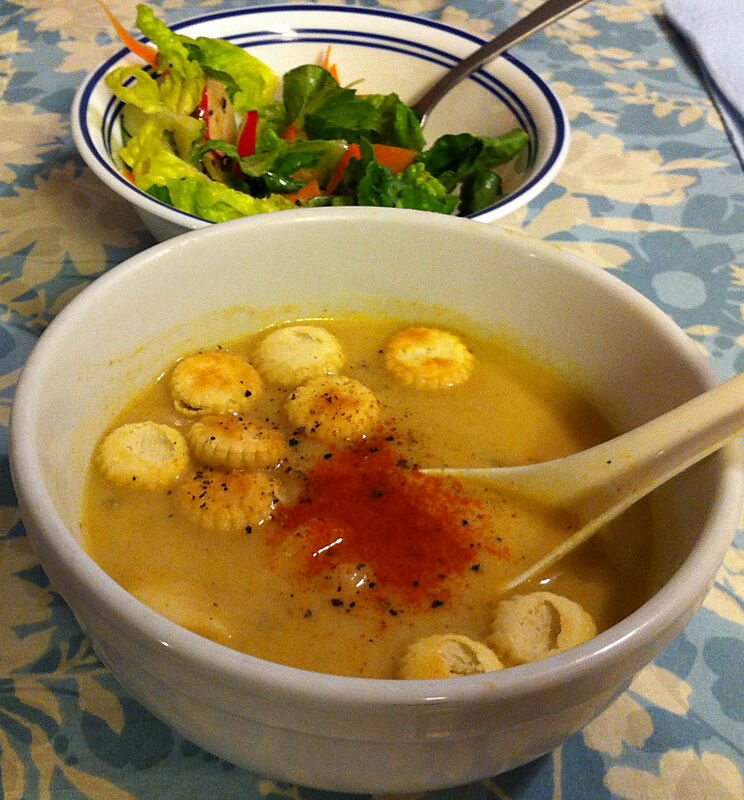 Serve a small green salad, oyster crackers, or crusty bread on the side.